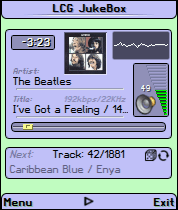 LCG Jukebox is a music player for mobile devices, that is designed to suit all your music listening desires. It has excellent sound quality, comfortable playlist management, easy music selection, equalizer and more. Additionally it can find album image and song lyrics on the Internet, to enhance your listening experience. Simply everything to perfectly enjoy your music collection! Mini mode displayed on phone idle screen. Does it play all .WMA formats?